After winning gold at the 2013 Pan Americans, Alfonso Washington takes home his second Grand Slam medal of 2013 for Crazy 88. "He does a good job of stepping up his focus and competition level on the bigger stages." This past weekend, Alfonso Washington won gold at the Pan American Championship, taking home his second Grand Slam medal of 2013 for Crazy 88 Brazilian Jiu-Jitsu. The Pan Jiu-Jitsu Championship is the second tournament in a series of the four distinguished Brazilian Jiu-Jitsu competitions in the world. It is held each year in Irvine, California. The Pan Jiu-Jitsu Championship which is run by the International Brazilian Jiu-Jitsu Federation (IBJJF), is known for attracting the most elite competition in Brazilian Jiu-Jitsu. 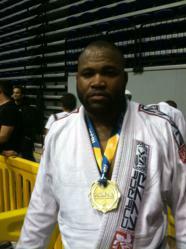 Crazy 88 Medal Chaser, Alfonso Washington, started off the year victorious winning first place at the European Open. This win adds another milestone to his resume for the year. Winning the Pan American Championship is a great comeback for Alfonso due to the fact after the European Open, he hit a few losses. In the course of the last few months Washington has traveled to San Francisco and Boston to compete in various tournaments in preparation for the Pan American Championship. However, in both tournaments Alfonso made an early exit, losing in the first round. Suffering from a nagging injury he was forced to not participate in the Chicago Open, leaving him winless heading into one of the toughest tournaments in Brazilian Jiu-Jitsu. Alfonso started off the tournament by tapping out his first opponent. The next three bouts to the championship came with some difficulty, however he was able to prevail winning his second Pan American Championship. For more information and updates regarding the competitors during the 2013 season visit us at http://www.baltimoremixedmartialarts.com.